From Isaac Asimov’s first use of the word ‘robotics’ in 1942, the use of tele-‘robotic’ devices as a liaison between man and machine never ceases to intrigue us. We have always strived to utilize more complex tools to assist in solving daily challenges. This growth has also occurred in the field of microsurgery. From the introduction of the use of the operating microscope in the 1970s, microsurgeons continue to strive to improve techniques and tools to perform complex microsurgical procedures. 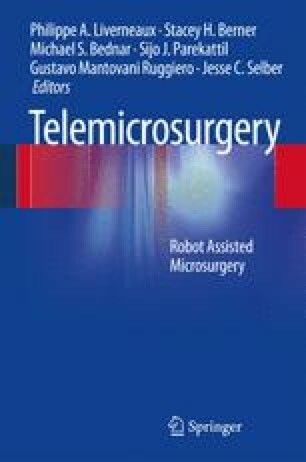 The use of robotic assistance in microsurgery intuitively makes sense as a continued journey in this direction. However, the path is still being defined, and there is still a need for further development. This chapter covers the history of robotics, the evolution of instrumentation and our current state of the art tools and platforms for robotic-assisted microsurgery.